Dane Shipps is a worker aboard the spaceship King Space Void, a gigantic ship that fuels itself by eating planets. He and the other workers worship the ship as their god and believe it will take them to a paradise called the Edge. On an especially bad day for Dane, he meets a woman from a planet King Space Void is about to devour. She convinces him to join him in finding out the truth behind this ship Dane has lived in all his life. Bizarro is a broad term. Though this is labeled as Bizarro, it solidly fits in the science fiction genre, though an offbeat kind. This is the type of work I could imagine having appeared in the Dangerous Visions anthologies back in the day. The plot is relatively simple. Dane and his companion are fighting their way up the ship to find out who’s controlling it and stop them. Each of the levels of the ship are highly imaginative. This is more like a darker Wizard of Oz or Labyrinth style journey through dream-like landscapes than a traditional space adventure like the premise would suggest. Pools of slime stuck to the bottom of Dane’s shoes. The floor, walls, and ceiling were studded with pulsating tumors that ranged in size from fists to large boulders. Across their surface were puffy slits that wept thick, milky teardrops, while other sat, motionless and benign. The story moves at a fast pace. This is a book you could probably finish in about an hour, which is both a strength and a flaw. Trevino’s imagination feels a bit limited by the novella’s short length. This would have really benefited from being longer. This becomes especially apparent with characters who are introduced and seem important, only to be killed two pages later. 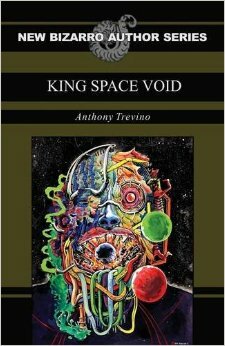 King Space Void is a fine example of oddball science fiction. The ideas on display in it show Trevino as an imagination with a lot of potential. This novella is well worth picking up.